Legislature veteran Lee Barron sat in at the Capitol for friend and comrade Rep. Steve Miller, R-Fairfield, for six days over the past week. “I’m sure it’s a slap in the face to some of the people up there in Ketchum,” Barron said with a laugh on Monday. Barron ran as a team with Miller in the 2012 election, with both seeking seeks representing District 26 in the House of Representatives. Miller ran for and won the seat formerly held by Rep. Wendy Jaquet, D-Ketchum, and Barron lost his race against sitting Rep. Donna Pence, D-Gooding. Pence won 59 percent of the vote in District 26 and has traditionally enjoyed more support from Democratic-leaning Blaine County than have her Republican opponents. 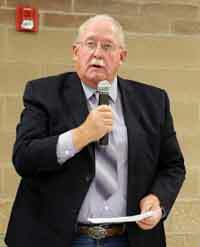 Miller is the chair of the Camas Soil Conservation District. He’s also secretary of the National Association of Conservation Districts, and is at the association’s national conference in San Antonio, Texas, until Thursday. Idaho code allows for Idaho lawmakers taking planned absences to appoint someone to fill in and vote on their behalf. Barron was sworn in by the speaker of the House last Thursday and his appointment was approved by Gov. Butch Otter. Barron said he’s been taking Miller’s place on the Joint Finance and Appropriations Committee, House Agricultural Affairs Committee and the House Resources and Conservation Committee since Thursday, Jan. 24. Barron served in the Idaho House of Representatives for two sessions, in 1973 and 1974. He said he served on the House Transportation and Printing committees, the latter of which has since been abolished. Barron said that filling in for Miller was giving him good experience that could help when he runs for Pence’s seat again in 2014. “Now I’m a jack of all trades,” he said. In the 40 years since he last served in the Legislature, not much has changed, he said.